Right off the bat, developed by Extra Mile Studios, Aqua TV is not a video game, but it is digital aquarium you can take on the go with you and it is gorgeous! Available on a range of platforms, including iOS and Android devices, Aqua TV in a way, is what CrowdStar’s Happy Aquarium wasn’t. Unlike the Facebook developed game that allowed players to build their own aquarium by taking a tank and filling it up with cutesy designed fish of your choice, Aqua TV goes in a completely different direction, 3D realism. The marine life in Aqua TV don’t just look a lot like the real thing, but they also mirror a lot of the swimming patterns of the animals that they are meant to represent. For me, this one fact is a huge plus, especially since as much as I would love to scuba dive 24/7, it wouldn’t exactly be good for my health, so anytime I can play a video game that “puts me in the water” or reminds me of what I am missing out on, definitely deserves my time and attention. Sure, you might not be able to scuba dive with them like you can in GO VACATION or the Endless Ocean games (come on Endless Ocean 3! The Switch needs you,) but one of my favourite things to do whilst scuba diving, is finding a good place to stop and hover as I gaze around a reef and let my eyes wander. From small crustaceans to large fish, there is always plenty to see and even if I have seen the same animal more than 100 times already, I’m still going to let my eyes linger over them, as that’s the kind of scuba diver I am, an insanely appreciative one who still harbours a love for what he does and what he sees, after 10 years off strapping a tank full of air to my back and plunging to the depths! Now, I may have gone off topic just a little there, but it is partly relevant because when I have Aqua TV docked and I’ve got my Tropical Reef tank loaded up, with shuffle on to change the camera angles, it almost feels like I’m back in the water, letting myself wander once again. Only, I’m not in the water and I didn’t have to spend five minutes slipping into a dry wet-suit, another 10 minutes to set up kit and check it over twice. Instead, I’m sat in a comfy chair, with a drink in one hand. So, to “long story short,” just watching your creation, can be both an immersive and therapeutic affair, only as much as I miss having actual fish tanks and keeping them alive, you don’t need to concern yourself with those things with Aqua TV. As nice as it would have been to occasionally clean the tank and feed the fish living in it, these are things you will never have to concern yourself with. In other words, unlike with a real aquarium, if you need to go out of town for a weekend or a week, you will not need to get someone round to feed them in your absence, due to your fear of your sharks (only available in the Tropical Reef tank,) eating your turtles. Naturally, due to the Switch’s portability, you can of course take the console with you and “play” Aqua TV at any time, but the point is, you won’t have to. You can just walk, run or even drive away and all of your private aquariums will be completely unaffected. Only, because Aqua TV is an app that lets you make your own aquariums, how about we talk about the development process? Aqua TV has four different kinds of tanks for players to choose between, with three having size dimensions and restrictions on what you can have in them. The other tank is a tropical one that you can fill full of wonderful marine life, such as Manta Rays. You also won’t have to worry about performance either, especially if you stuff the Tropical Reef tank with lots of creatures, since even when it has 300 lifeforms in it, Aqua TV will continue to run at a steady 30 FPS, which in other words basically means that Aqua TV on Switch is actually the best version of the game in terms of performance as even the PlayStation 4 and Xbox One versions can’t offer that. The only limitation that the Tropical Reef tank has however, is although it can hold every kind of marine animal and lots of them, you are limited to a set background, whereas with the other tanks, players can choose their preferred backdrop from a range of in-game available images. They can also change the floor and add in whatever ornament they wish from those available. The offerings might not be nearly enough for some players, but there are still plenty of customisations so that you can create multiple aquariums out of the same sized tanks and not have them be a carbon copy of one of them. Once you have a set-up you like however, it’s time to put your fish in, just be warned the smaller the tank you create, the less fish you can have it in, but if you do away with the ornament, you can throw a few more in. Only when everything is as you like it, you can then choose to go to the settings and go through shuffle and select the soundtrack you want. These settings won’t just affect the tank you’re currently on, but all of them, so you will hear the same selected song for every tank. You do however have the option to select a silent soundtrack, which is a track, where there is no sound whatsoever. Provided you have created more than one tank (I have four,) by enabling shuffle and setting it to one minute, when it comes time to viewing, players can essentially sit back and relax as the game takes them on a tour through all of their tanks and at differing angles, whilst being completely random. In the event you don’t like a one minute shuffle though, you can always opt for three, five and ten minutes or just set it to off and then when viewing, simply change the camera angles yourself and change between tanks as you see fit. It is entirely up to you and for what it’s worth, although you don’t need to play the game with the touch-screen controls, they are available to those who do and they work rather well. You know what else works well, other than Aqua TV on the whole? Video capture! Instead of just being limited to sharing the occasional screenshot of your aquariums, should you create something you are really proud of, there is nothing stopping you from taking a 30 second long video of it and sharing it on social media. I sure did. My only complaint with Aqua TV however, is a greedy one, as I would have loved to have more of a selection when it comes to the marine life and the backgrounds, or at least have the option to use screenshots from the Switch album. No doubt, I’d use an image from the Lake Kingdom in Super Mario Odyssey, or even a snap of Zora’s Domain from The Legend of Zelda: Breath of the Wild. But hey, that’s just me being greedy. Aqua TV is a fantastic creation and I’d love to see what becomes of it, should its developer try to expand upon it with a possible second instalment. While there is no substitute for the real thing, provided you can afford to a fish tank in your living room, the truth is, at $9.99 Aqua TV is a product worthy of its price tag. 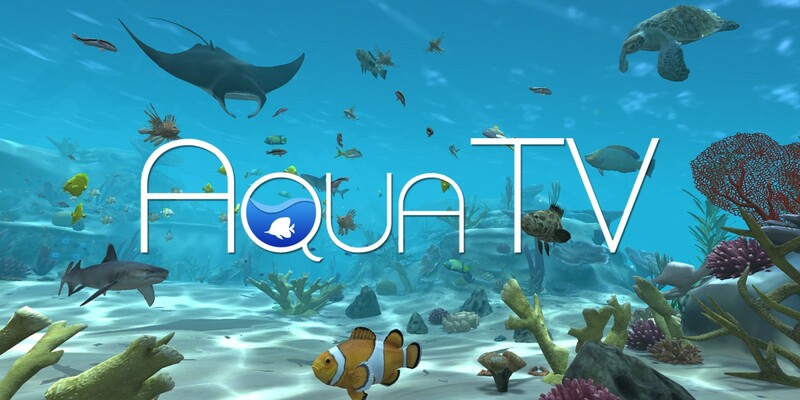 Whether you wish to use it as a means of therapeutic relaxation or just something you want to put on the TV when you have your friends out, Aqua TV is a rather nifty simulation and the scuba diver in me highly approves of it!